Credential can help FMs differentiate themselves, earn higher salaries, and show that they're bringing better value to their employers. Given the plethora of potential credentials available to facility managers, the $64,000 question remains, "Is there value in obtaining one?" The answer is a resounding yes. There are numerous reasons to substantiate the claim. • Differentiator. Credentials can be a differentiator at the hiring stage and also provide evidence of additional expertise for promotional opportunities. The proper credential can make it easier to move upwards in an organization or into another type of position. Credentials help open doors to related professions that initially lie at the periphery of facility management expertise. A candidate for a position in facility management may come armed with years of excellent experience, but having a facility-management-related credential on a resume sends a signal to peers and the prospective employer that the candidate is interested in continuous learning and is staying current on the latest developments in the industry. All things being equal, the candidate with a credential stands out from other candidates. • Monetary reward. A facility manager with a credential typically earns more money than a professional without one. If the mantra "show me the money" is important, then the value of having a credential is reflected in the statistics related to salaries. Consider data from a Building Operating Management salary survey conducted in 2017. The median salary for respondents who hold a certification was $92,000. For those who don't hold a certification? The median was $80,000. At some point in time, almost every facility management function requires project management expertise. Expertise in this area can be gained through a project management credential, which gives facility managers added opportunity for salary enhancement. The Global Knowledge 2017 IT Skills and Salary Survey provides current information on the value of a project management credential. The survey data reveals the fifth highest paying certification in most fields is the Project Management Professional (PMP). The median salary was $119,349. • Value add. For many facility managers, having a credential signifies they are bringing added value and expertise to the facility department as well as to the parent organization. Beyond the potential for monetary reward, having a credential from an industry-recognized institution provides a certain cachet. Armed with additional credentials, these facility managers may have the chance to participate on company-wide cross-functional teams, rotational assignments outside facility management, or special project exercises. Employers know it is challenging to find competent facility staff to meet both current and future needs of the organization. The Building Operating Management FM Workforce Survey in 2017 provides insight into how employers struggle to find the right staff. The question was posed: "What problems have you experienced in hiring, developing, and retaining staff?" Of the 284 responses, 57 percent said finding qualified job applicants was their most pressing problem. Certification can help employers close skills gaps. Employers are spending more time assessing the skills gaps shortages in facility management by conducting studies on current employee knowledge, skills, and abilities, and projecting future needs in those areas. The gap between current staff capabilities and those required for the future provides a guide for employers on what credentials staff need to have. Credentials assist employers in determining skill levels without having to perform specialized assessments on current staff members or new applicants because the profession already has vetted them. In addition to closing skills gaps for future needs, hiring or promoting individuals with credentials also enhances the overall reputation and stature of facility management within the parent organization. Having a stable of professionals with credentials universally recognized signals to senior executives that their facilities portfolio is being protected and managed by the highest caliber of staff. Credentialed facility management professionals have an advantage and that value increasingly is recognized by employers. More and more employers are stipulating in their announcements for new hires and promotions that candidates must have, or it is preferred that they have, a facility-management-related credential. Creating a pool of talented and credentialed professionals is essential to the success of a facility management organization. Another benefit to employers is that a credentialed facility management staff may reduce reliance on external expertise. It may be an overstatement to say that all required expertise can be provided by in-house facility management staff with credentials. It is fair to say, however, that with enhanced in-house capabilities, there may be less need to augment expertise from the outside. 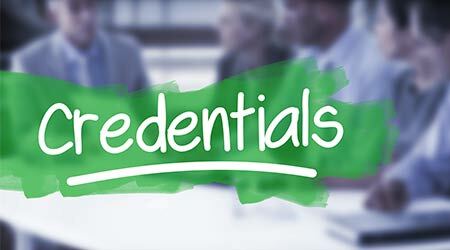 Employers see the value in credentials and are offering more and more support to staff to obtain them. A testimony to this statement comes from another question posed in the 2017 BOM FM Workforce Survey. The survey asked: "Does your organization provide support for employees to get FM certifications/designations?” Of the 267 respondents, 66 percent said their organizations provided support to their employees.